Shiver me timbers, ruffle your feathers, and tickle your fancy when you take a gander at this attractive rug in rich colors of ivory, beige, tan and dark brown. Warm, inviting, rugs inspired by Navajo weaving traditions and reproduced to have the literal feel, texture, weave and look of the Navajo hand-woven rug.... now your talking!! 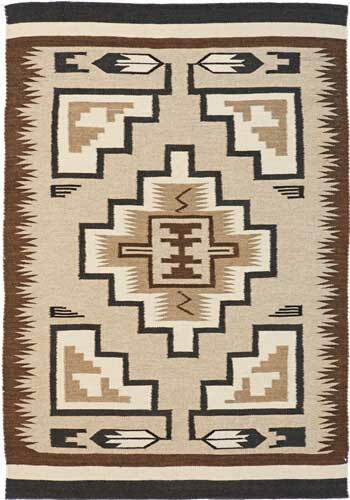 New Zealand wool and color fast Swiss dyes, these rugs are sure to become treasures of the Sierra Madre! !